Few want to be ‘that person’ … the one whose phone rings first when some aspect of the organization’s critical infrastructure fails. Hoping for the best is all well and good. Even planning for the worst only goes so far. 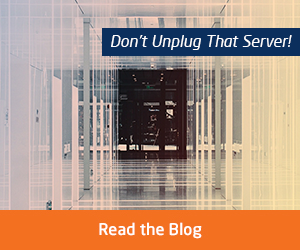 There are just too many variables in preventing unexpected outages to be totally failsafe. Yes, there are some situations that can be planned for. But the severity of even known concerns can mean the difference between a manageable and challenging scenario. When disaster does strike, it is all about recovering to a state of normalcy quickly and minimizing any impact to the end user experience. This applies to almost every aspect in risk management, whether it be for a physical location or operational infrastructure. Here at NEC, disaster preparedness can be broken down into 3 core competencies – otherwise known as the 3 R’s. Fully redundant architecture that supports and runs in lockstep with mission critical infrastructure. Information must be protected yet accessible before and after the restoration of essential services. Our high availability infrastructure works to deliver a multi-tiered resilient environment that recovers quickly should disaster strike through the use of our Five9s Fault Tolerant servers, disaster recovery software and SAN and Scale-Out Grid Storage solutions. Our Fault Tolerant servers and ExpressCluster® software are viable options for effective redundancy protection of physical security applications and possible hardware, software and site infrastructure failure. Simplified environments based on stable, flexible foundations that elevate security and responsiveness. To alleviate the risk of data loss and the expense of investing in backup management infrastructure, third-party hosting is a viable alternative while SDN solutions deliver greater oversight for companies interested in keeping control in-house. NEC is uniquely positioned to deliver Backup-as-a-Service. As the first technology infrastructure provider to join Iron Mountain’s Data Center Marketplace, we can help protect and deliver accessibility of the data stores we host through Iron Mountain’s secure, compliant and energy efficient data centers in North Virginia (VA10) and West Pennsylvania (WPA1). With so much depending on the network, our software defined networking software and switches can deliver granular, end-to-end network visibility and administrative insight from one central point to promote continuous supervision and greater operability. Deliverables that best adapt to the needs of internal and external users through optimized experiences. For optimum protection of those on-site and within related or nearby offices, emergency protocols can be a vital life line. NEC’s highly accurate facial recognition technology provide better situational awareness through the use of identification matching software and video surveillance for greater on-site safety and more appropriate course of action. Where large numbers of people must be reached quickly, our mass communications solutions can send voice, email and text messages or a combination of all so people stay informed and remain vigilant. Our enterprise security solutions provide a comprehensive package of options that range from streamlining visitor handling, providing employees with a secure environment through physical and visual safeguards and helping to make your critical processes highly available. Don’t wait for that next phone call or incidence. Let NEC provide a roadmap on critical IT, communications and on-site recovery that will help your organization’s preparedness in disaster recovery. What’s “More Personal” Than Your Face? The path to a frictionless, personalized customer experience begins with something unique and individual—your face. Using facial recognition technology, a single unified biometric key enables a seamless experience as you move through an environment, whether it’s a sports stadium, entertainment facility, airport, hotel or casino. Facial recognition technology is the key that unlocks a contactless customer experience in a wide range of venues and situations. What could be more convenient or more secure? 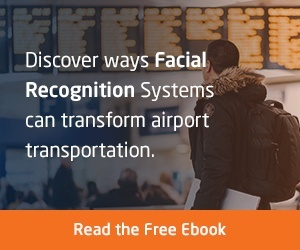 Recent developments in facial recognition solutions are not only enhancing security in airports, stadiums or hospitality locations, but also making access to public spaces more convenient, effortless and personal for patrons. Today, consumers are enjoying the speed and security of unlocking their phones using facial recognition, without the bother of passcodes. These demonstrable user benefits have made face-driven technology more common and acceptable as a secure and time-saving part of our day. Increasingly, consumers are looking for this same easy, contactless and convenient experience in other areas of their daily lives. Benefits of biometric technology are applicable to other situations that require secure access and easy transactions. Here are a just few ways NEC, a leading global provider of Advance Recognition Systems technology, is changing today’s customer experience through facial recognition. A game day experience can be exciting and fun. However, you may have to navigate through a few long lines before you can get to your seat to cheer on your team. Sports arenas handle large crowds on a regular basis. In fact, in 2017, the NFL alone had more than 17 million spectators attend its regular season games, while the NBA averaged 17,830 visitors per game in 2017 and 2018. With large crowds, come inevitable “pinch points” as fans move through the venue. What if advanced facial recognition technology could eliminate some of those stress points and create a more pleasurable and hassle-free fan experience? Everything from dropping your car off in a parking garage, entering the gate, purchasing concessions or swooping into a VIP suite is made easier by using a unified biometric key as a virtual parking pass, wallet and secure entry ticket. Guests no longer need to juggle parking permits, paper tickets, cash or credit cards. They don’t even have to remember where they stored their electronic tickets or try to recall app passcodes or loyalty numbers. Best of all, no more waiting in long, annoying lines. Let’s be honest, who wants to wait 20 minutes just to buy a water at the concessions? A single unified biometric key triggers concierge alerts when a VIP enters a hotel or casino, prompting enhanced guest services and special offers to the valued patron. Front-desk staff can greet returning loyalty guests by name, further personalizing the check-in experience. 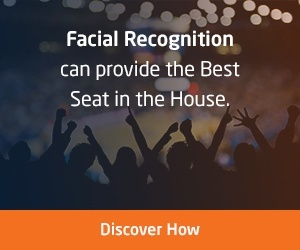 Stadium VIP patrons enter suites seamlessly using facial recognition. Enhanced services are delivered in a more personalized way. Theme parks quickly admit season pass patrons through the gates using facial recognition, with the ability to provide special offers and services geared to loyal guests. Often the technology can be integrated with and deployed using existing venue systems, making the installation an even easier, more cost effective situation. Since customers’ purchasing during an event is faster using a single unified biometric key, this increases the number of transactions that can be processed in the finite duration of an event. Not having to bother with cash or credit cards speeds up purchases and enables staff to serve more customers more quickly. Facial recognition technology also captures crowd estimates at venue entrances, concession areas, hotel lobbies or retail areas so additional staff can be deployed immediately where they are most needed. On-site offers can enhance the customer experience. Facility managers don’t really know who is attending a sporting event or musical performance. They know who bought a ticket, but not much information about the purchaser. Facial recognition provides real-time demographic data about attendees or guests to enable a venue to further shape the customer experience with on-the-spot offers and services. For instance, if a stadium has facial recognition data that shows it has a large percentage of young men ages 21-29 in attendance for an event, it can prepare by stocking more beer at the concession stands, or change the advertising on retail shop displays to appeal to this demographic, or even alter music choices in the common areas. Marketing partners and sponsors are able to curate offers in real time to appeal to a certain type of guest—enhancing the customer experience and positively affecting brand recognition and potential sales as well. Stadiums, theme parks and hotels are not the only facilities being transformed into more efficient and secure places. The transportation industry is also seeing new uses for NEC’s facial recognition technology, considered to be the world’s best in search speed and accuracy according to the National Institute of Standards and Technology (NIST).Transportation should be about getting to your destination quickly and with as few problems as possible. Today’s airports are busier, more congested and more stressful than ever. According to the Bureau of Transportation Statistics, more than 821 million passengers boarded U.S. airline flights in 2016—and with the demand for air travel expected to double over the next 20 years, this will certainly make for some very crowded airports. In the United States, facial recognition technology is being tested to permit passengers to board flights quickly, and also for fast access to airline lounges. Since the Customs and Border Protection (CBP) agency started testing NEC’s NeoFace® Express facial recognition solution in U.S. airports in 2016, it has registered a success rate of close to 99%. Other airport-related potential uses of a single unified biometric key include: passenger check-in counters, bag drops, in-airport entertainment, boarding, retail and monitoring baggage claim areas. The cruise ship industry is finding that a single unified biometric key can be used for everything from terminal queue management and effortless check-in to frictionless embarkation and debarkation, and for seamless payments and onboard purchasing. Security concerns have invaded almost all aspects of our lives in recent years—from travel to entertainment and sporting venues to retail spaces. Unfortunately, when people gather in public places, there is automatically the awareness of an increased threat, forcing security concerns to be uppermost in our minds. Our reality is the tension between the heightened focus on keeping public places safe while not having a negative effect on the actual customer experience. The ability to create an excellent customer experience requires balancing both efficiency and security. Authorities responsible for the safety of public places are extremely concerned, and debates over how best to address security concerns are ongoing. At the same time, increased usage of facial recognition in consumer products is making the technology more acceptable as consumers recognize the convenience it provides: frictionless, personalized and secure experiences. Solutions that combine surveillance cameras with facial recognition software can elevate the level of public security in airports, stadiums and other public places. Also, enterprises can ensure only authorized personnel have access to their facilities, while retailers and sports and entertainment venues can secure their facilities and protect their customers. Deploying a single unified biometric key based on facial recognition technology helps deliver a superior guest experience. Our unique face is rapidly becoming the universal key to replacing our usernames, passwords, paper tickets, parking permits, payment options and even more. Whether at a stadium or a major transportation facility, NEC’s Advanced Recognition Systems solutions are at the forefront of reinventing the customer journey by melding the optimal combination of convenience and security. Facial recognition technology has matured rapidly and provides game-changing solutions to today’s identification challenges. To learn more, fill out the form to download the white paper. 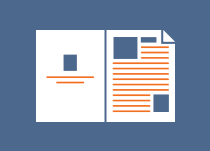 The Gartner Magic Quadrant has long held a place of reverence in the Information and Communications Technology industry as a go-to resource for large enterprises seeking a short list of vendors to consider for technology purchases and projects. As you may know, NEC is regularly included in a number of Gartner reports, most notably the recently updated 2018 Magic Quadrant for Unified Communications. Despite the fact that NEC is the world leader in lines shipped – with a 14.3 % market share in Global Call Control Licenses Vendor over Q1 2018 according to MZA Consultants – and despite the fact that we offer a full portfolio of UC solutions for businesses small, medium and large, Gartner has decided to place us in the “niche” category. I’d like to share a few points of fact that I think you should consider when reading this year’s updated UC Magic Quadrant. Let’s start with the name. I believe the widely accepted phrase “unified communications” is reaching its end of life. I’m not the only person who believes this, in fact there are several prominent industry analysts who share this opinion. His point is valid. We live in a highly customized world. Different business processes drive unique requirements, and we in the vendor community have learned that we must be able to integrate to survive. This is what we as NEC successfully demonstrate and are widely recognized as doing with our smart and integrated solutions across many vertical market sectors such as Hospitality, Healthcare, Government and Education. Slaymaker furthermore does not agree with the positioning given by Gartner to several major vendors, including NEC. Furthermore it is worthwhile noting that, not unlike the market overall, a significant portion of our customers are categorized as ‘midsize businesses,’ while analysts like Gartner tend to be disproportionately impressed by major firms with larger marketing budgets. The strong marketing influence of American-based vendors like Cisco, Microsoft and Avaya is another aspect to consider when evaluating Gartner’s latest Magic Quadrant. The truth of the matter is there’s no perfect Magic Quadrant that can accurately capture the essence of NEC’s enterprise technology business. As a result, you’ll find NEC products, services and solutions captured in 11 different Gartner Magic Quadrants, at last count. Today’s large businesses run highly customized IT and communications environments, and rather than seeking point solutions to react to specific problems, they’re becoming more strategic about their buying decisions. NEC believes this strategic approach is best achieved by focusing on the four value pillars of the Smart Enterprise. These pillars are business agility, cloud delivery, collaborative communities and assured services. NEC supports these four pillars by delivering the industry’s strongest and most innovative portfolio of IT and communications solutions built on 118 years of excellence and expertise. You can learn more about the Smart Enterprise on our Web site. Gartner’s library of Magic Quadrants is constantly evolving. For example, the company retired its Corporate Telephony Magic Quadrant a few years ago. Many believe the same will be true for the UC Magic Quadrant before too long. In the meantime, NEC will continue to pursue optimal positioning with Gartner and other industry influencers with all available facts, vision and information regarding our products, solutions and implementations, as we’ve always done. And while the era of optimal usefulness may be coming to an end for the UC Magic Quadrant, NEC maintains a healthy rating over on the Gartner Peer Insights Web portal. If you’re not familiar, Gartner Peer Insights is where you can find customer testimonials on numerous IT vendor solutions. NEC has numerous positive reviews in numerous categories. I encourage you to check it out. And if you’re an NEC customer, please do us a favor and leave a review! After all, in the customer’s buying journey, there’s very little information that’s more useful than hearing from a peer who has walked a mile in your shoes. Hundreds of attendees converged on the Gaylord Texan Resort to attend the 25th anniversary of NEC Corporation of America’s 2018 Advantage Executive Conference . The three-day gathering brought together top-performing NEC partners and solution integrators, along with distributors, resellers and IT and UC consultants. This year’s conference agenda emphasized sharing success stories of transformation—through selling and implementing Smart Enterprise solutions in businesses of all sizes. Playing off a theme of “Exchange. Transform. Experience.” keynote presentations focused on how Digital Transformation is altering today’s business landscape. Paul Kievit, head of NEC’s enterprise business for EMEA and the Americas, noted that the integration of digital technology permeates all areas of business, causing a cultural shift in which organizations increasingly challenge the status quo with technology and innovation. NEC’s success comes from delivering IT and communications to create customer solutions for digital transformation. Opportunities for attendees to network, exchange lessons learned and share new ideas expanded this year with the addition of expanded breakout sessions and solution demos. “We listened to feedback from our partners and transformed our conference to include more breakouts, unique sessions, customer stories and partner experiences,” said Larry Levenberg, vice president of sales. One of the highlights this year was the “Proud to Partner” session with presentations by a panel of partners Guyette Communications Industries, ServiceMark Telecom, Matrix Communications and Magna5. Representatives from each company described their organizations’ own recent transformational experiences, sharing advice and lessons learned with partners planning to embark on a similar path. He went on to say that this past year NEC expanded its strategy by functionally combining operations in NEC America with those of NEC EMEA. This combination propels innovation and simplification of the company’s products, resulting in greater support for both partners and customers. Advantage also provided an excellent opportunity for partners and consultants to meet directly with NEC solutions experts and the management team. The expo area featured demos of NEC’s IT and UC solutions for both SMB and enterprise, including cloud, biometrics and analytics. Valued partners who provide joint solutions with NEC also showcased their demos in the expo area. To learn more about NEC’s Solutions for Smart Enterprise visit the website. To learn more about NEC’s solutions portfolio or to become a Channel Partner, fill out the form today. Hey Buddy!, I found this information for you: "Retailers Need to Focus on Point-of-Service over Point-of-Sale for More Personalized Shopping Experiences". Here is the website link: http://nectoday.com/retailers-need-to-focus-on-point-of-service-over-point-of-sale-for-more-personalized-shopping-experiences/. Thank you.